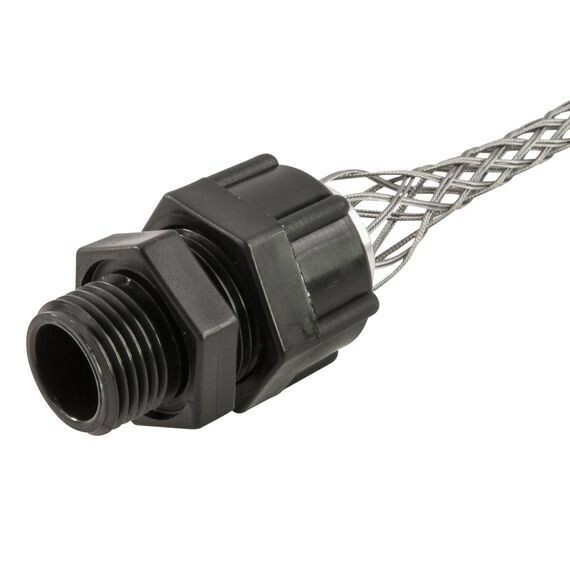 Remke Cord Grips made of Valox® are cutting-edge, non-metallic connectors with excellent heat, chemical and corrosion resistance. This material provides high mechanical, thermal and electrical properties for stability and reliability. Rated for IP and NEMA compliance, Remke Valox cord grips are ideal for applications both indoors & outdoors that require an environmental seal against dirt, dust, moisture, fumes and chemicals.They are approved for FDA-washdowns and are commonly used in Automation, OEMs Maintenance and repair operations, food processing, wastewater treatment, Petro chemical, marine and shipboard, pulp and paper processing. Valox is a thermoplastic, polyester resin that is rated IP 52, IP 54, IP 56, IP 65, IP 67 and NEMA 3, NEMA 3R, NEMA 4, NEMA 4X, NEMA 6 and NEMA 12. 90-degree body for ½” and ¾” conduit.